So Who Do We Have Here? This site contains family lines descending from Thomas Fergusson (c1760-1844) of Moulin, Perthshire, and the related families of his descendants. 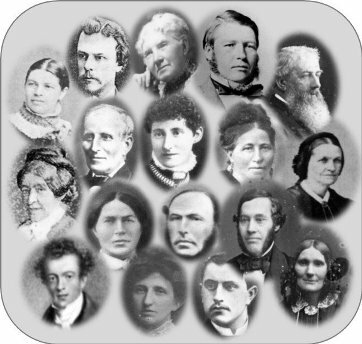 You will find many other family names in the Surname Index, including ancestors of spouses of the living. While it may seem sensible to keep these separate, it is difficult to do so in anything other than an arbitrary fashion. For example, the village of Black Notley, Essex, housed Forsaith and Wicks families who were, at that stage, totally unrelated. Did they know each other? Almost certainly! For these and other reasons, all the families have been kept in the one database, even though the relationships may not, at first, be clear. The Family Lines - Direct and Family Lines - Indirect pages and the linked pedigree charts will give you the connections from the current generations. Research Background The family research recorded here was first initiated in the 1960's on lengthy paper scrolls. Since then a variety of computerised methods have been used so that we now have about 6800 entries in a TMG database, of which only about half appear here. The discrepancy is due to the non-publication of some relatives of living Ferguson descendants, and the need to preserve the privacy of the living - anyone wishing to know more about generations other than those presented here should contact us directly (click on the 'Research by..' entry in the footnote below to send an email). Errors and Omissions Yes, there are many, as family research is an inexact process which attempts to correlate information of a vague and often contradictory nature. Feel free to contact me with more exact information and we can work together to improve this resource for all. Copyright Facts, names, dates and places cannot be copyrighted; they are publicly available information. The rest of the materials on this site may be copied, or have derivative works based on them, only as long as you credit this website for the original content.